DUST-FREE Aston Drywall Repair by Mulholland Painting! When it comes to fast quality drywall restoration in Aston Pennsylvania, Mulholland Painting's experienced drywall techs are ready. Using our DUST-FREE technology with a professional Festool's Drywall Sander, there will be no dusty mess left behind! We'll remove all affected areas that are damaged beyond repair and install new drywall in your Aston home. Once replaced with new, dry, material. Mulholland Painting will restore your Aston walls to original condition by utilizing our Aston house painting skills. Call (215) 315-3215 for an Aston drywall quote! Whether filling in a small hole or replacing a large section of drywall in your Aston home or office, Mulholland Painting's expert repairmen can do the job quickly, often finishing the job in a day or two, including painting the wall with a matching color. When you call Mulholland Painting to repair your drywall in Aston, you're not only getting a skilled drywall contractor, you're getting one of the best painters in Aston to fully complete the job. When looking to repair drywall in Aston, Pennsylvania, families and business owners know to call Mulholland Painting, the locally trusted name in Aston drywall repair. 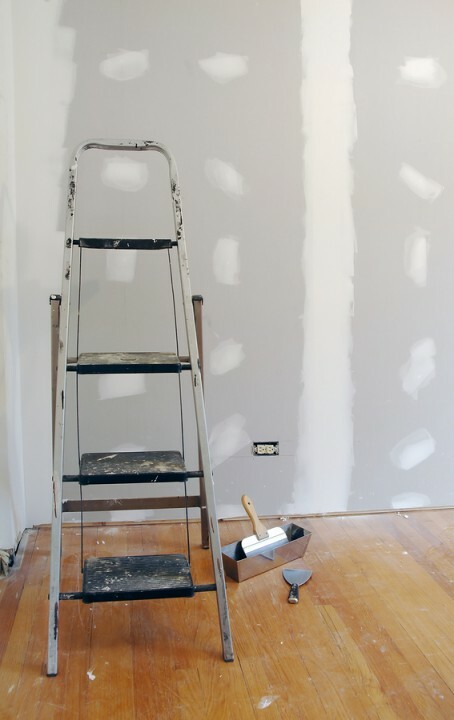 For fast drywall repair in Aston, Pennsylvania, call Mulholland Painting today! 5★★★★★ - "Courteous, punctual and professional. Would use him again." 5★★★★★ - "Pete was professional and a quality service provider. I wanted to stain my deck and my backyard fence. He was able to stop and provide an estimate within 24 hours of my request. More amazingly, once we decided to have Pete do the work, he scheduled the work for the following week! His team was on time, never missed a commitment, and did quality work. The transformation of my yard has gotten the attention of my neighbors and I couldn't be more satisfied. Thanks to Pete and his crew for a great job at a reasonable price." 5★★★★★ - "My wife and hired Popcorn Pete-Mulholland Painting to paint the exterior of our home just before we put it up for sale. Wow, what a transformation! The house now looks better than ever and has great curb appeal. Pete and his crew delivered everything as promised and more for a very fair price. The entire crew was friendly, prompt, and professional. We couldn't be happier with the results and plan on recommending Pete to our friends and family. If you're thinking of hiring him for a job, you won't find a better group to work with! Thanks Pete!!! . We really are so happy with the work you did here and although we haven't sold the house yet we do have several people interested and have gotten wonderful feedback from potential buyers. Hope all is well with you and thanks again!" 5★★★★★ - "Pete and his crew are great. I recently had a French drain put in my finished basement because we were getting water. After the drain was installed I needed to replace the walls and have it repainted. I had a few estimates come in and Pete blew them all away in pricing. Pricing was so reasonable that we went on to have them paint our entire home. Walls, trim, and ceiling. As for quality, the place looks fantastic, they took the kind of care with our home that you would imagine they would take if they were doing their own home. These guys are very professional, accommodating, and will get the job right. Will hire again." 5★★★★★ - "They did a beautiful job: arrived on time and went out of their way to clean up at the end of each work day. As a result of their excellent performance, I have already scheduled a second job with this painting and drywall repair professional." 5★★★★★ - "Professional service good job!" 5★★★★★ - "I'm a single, 20-something gal in Philly. I'm outrageously busy, inexperienced at working with contractors, and, honestly, was a little nervous about having some guy coming in and out of my apartment. Pete was great. Pleasant, responsive, flexible with my schedule, and very thorough. His estimate was accurate, we were able to schedule the repair within a week of the initial estiamate, and even when they encountered additional issues with the fix (2 leaking pipes in addition to the leaking roof) he proposed reasonable solutions, helped me make a solid decision, and got the work complete without any additiona time. I would certainly use him again and recommend him to friends." 5★★★★★ - "I had water damage to a bedroom ceiling and needed it ripped out and replaced. Pete provided the best estimate and included more services than the other contractors, such as a mold/mildew treatment. I also liked that he wasn't just interested in slapping the new drywall up. He was convinced I had a major problem with my roof. The roofer who installed it 8 years ago insisted nothing was wrong with the roof and this leak was condensation. However, when another roofer looked at it he found that every seam was loose. So, thanks to Pete and his crew the true problem was found, fixed and I won't be replacing this same ceiling again next year." 5★★★★★ - "They did a great job for a great price. I would highly recommend them!" 5★★★★★ - "We were very pleased with the work you did in our living room. Thank you again, I would recommend you to my family." 5★★★★★ - "Pete not only paints but he and his crew redid my hardwood floors and put in a whole new kitchen floor and painted my house inside and out ! He totally renovated my house; it went from a fixer upper to move in ready and it sold in one day!! Popcorn Pete is awesome, highly recommend him." 5★★★★★ - "Contracted Popcorn Pete and his crew to remove popcorn ceilings from Condo. - concrete and sheetrock; (after reading stellar reviews). I met a contractor with experience, skill and integrity. (I have much experience with renovation and contractors.) Pete and his crew were able to transform the ceilings. They scraped, skimmed, and painted ceilings as if they were brand new. I was in awe. I did not expect the outcome - so perfect and flawless. Most important in this review is that each of the 4 day process - arrived on time, totally able to work with the protocol that goes on in a condo building - parking, getting materials to the floor, absolutely no trace of work debris in hallways - and cleaning unit each day as if no work had been done. Getting back to the work - Pete and his amazing crew were attentive to details - like artists. caulked around crown molding, skimmed a wall - like new and finished ceiling with primer/paint. They added to the value of the condo.!! Last, but definitely not least - the price was on point for the scope of the job -and that means for everyone reading this -- a full day of productive work from the entire crew. My experience with contractors is vast - Pete has the skills, experience, work ethic and integrity. (Trust me, whoever is reading this - unusual to find.)" 5★★★★★ - "They were very quick and efficient removing the wall paper. The ceiling in the hallway that looked so bad is beautiful. A previous contractor had told me the hall ceiling would need to be drywalled but Pete said I did not need to spend the extra money. His crew scraped, skimmed,sanded, and painted the ceiling and it looks perfect. They did a very nice job preparing all the walls for paint. Pete even helped me select a very nice accent color for one wall. Everyone that came into my house was very personable. My dog is missing the company." 5★★★★★ - "Thanks again to you and your men!! We so appreciate all the work you did for us. Everything looks great. Hope the house sells fast. Franny and I have been very pleased with your quick response and excellent work. Your team is the best. Please know it has been our pleasure working with you. We will certainly keep you in mind for the future." 5★★★★★ - "KUDOS!!!! You guys did a terrific job on Mom's ceiling. Sorry for the delay in getting this out to you. Your prompt and professional response eased her anxiety and she was more than pleased." 5★★★★★ - "We recently used Popcorn Pete for a project in my parents home in NE Phila. After multiple attempts to reach a reliable painter who could repair popcorn ceilings, we came across his website. Pete was fabulous to work with. He returned my call promptly, went to give an estimate within one working day, and followed up immediately that evening. The work was completed two days later, and they did a fantastic job. I would highly recommend them. It is not very easy to find someone so efficient, reliable and reasonable, but Popcorn Pete got the job done!" 5★★★★★ - "Pete is a wonderful person to work with. He is forthright, provides ideas and recommendations, and is very professional. His crew is polite and does great work. I had the interior of the entire house painted 2nd floor, 1st floor, and basement with some exterior painting completed on the shed and entrance doors. In the basement, the old tile floor was removed and the walls/floor were cleaned up and painted in the whole basement (finished and unfinished areas). The house looks awesome. All the quotes provided were clear, work was completed in the time promised, and Pete communicated through out – couldn’t ask for a better experience. I will hire Pete again and highly recommend his work. Thanks again and I'll be in touch soon about the floors!" 5★★★★★ - "What a wonderful crew! Ron, Jake, Joe and Pete thank you for your excellent job. Popcorn ceiling removal is a messy task but all dust was kept to a minimum. Everyday you cleaned up and treated my home as your home. My living room, dining room, bedroom room, stairway and hallway glow with their new paint! Yes, Jake I also love my accent "pumpkin" wall.Courteous,professional,clean and efficient all describe this team. I highly recommend this team for your ceiling and painting makeovers. I love my updated house. Thanks!" 5★★★★★ - "We just wanted to say thank you for a job well done!! From the wallpaper removal to the painting - everything looks great!Our thanks also to your crew; Ron, Jake, and Mac . What a great bunch of guys. They were on time every day and made sure the work area was cleaned every night. Can’t thank you guys enough. We learned after you finished our job that a few months back you had removed a popcorn ceiling from my sister in law's home who also said you did a great job on her project. Thanks again and we will keep you in mind for our next project." 5★★★★★ - "Thank you, the Popcorn Ceiling repairs were beautiful. I am so thrilled. Your workers Ron and Bill, were so neat courteous, and left everything perfect. I cannot thank you enough." 5★★★★★ - "After having great difficulty finding someone to correct and then refinish our popcorn ceiling in South Jersey where we live, I found “Popcorn Pete” and Mulholland Painting in Pennsylvania. One phone call led me to a team of ceiling refinishers that were courteous and professional. They were able to patch the needed areas, and then blend the entire ceiling to match the rest of the other rooms. We really appreciated how timely and efficiently they completed the job. Once they were through, the ceiling looked terrific! We would highly recommend “Popcorn Pete” to anyone needing to create a popcorn ceiling or to refresh an existing one." 5★★★★★ - "Pete did a wonderful job on the ceiling. Any issues we had were resolved in a timely manner and to our satisfaction. I would recommend his services." 5★★★★★ - "Pete and his team did a wonderful job painting our place - he is EXTREMELY professional and reliable!!! He always returns calls and e-mails and shows up at the expected time/day which is often not the case with other contractors. The finished paint job was perfect! Would definitely give him 5 stars and would recommend him to anyone!! Thank you so much Pete!!!" 5★★★★★ - "Pete was easy to work with and did a wonderful, efficient job." 5★★★★★ - "I thought they were a great crew, very easy to work with. Work looks great. I am very pleased with the finished product." 5★★★★★ - "Pete and his crew were absolute professionals in all aspects of the work done on our house. The previous owners of our house had left an abundance of wallpaper over every wall, cabinet and door. Pete was able to come in and within 3 days remove all wallpaper, patch and prime all walls/doors and even repair a few cracks that were found after removing the wallpaper. I would certainly recommend them and the work that they do to anyone considering wallpaper removal in their home. We are completely satisfied with the work his company has done." 5★★★★★ - "Absolutely fantastic workmanship." 5★★★★★ - "Pete and his crew were very professional, on-time, curtious, and their work was completed in the timeframe they said. I would recommend him to others." 5★★★★★ - "Great experience, efficient, clean, knowledgable & very courteous. Would definitely recommend to my freiends & definitely use his services again." 5★★★★★ - "One day and done, with good advice for painting. Great crew." 5★★★★★ - "Excellent customer service. Timely responses and good affordable suggestions. Pricing was good. They went over and beyond what is required to assist. I am very, very pleased." 5★★★★★ - "Pete was very accommodating to my time frame. He was able to schedule my job quickly. His team worked efficiently and professionally. They cleaned up after themselves. Pete called when job was complete to be sure I was satisfied. Pete and his team were great." 5★★★★★ - "Very professional in answering request, and doing work. Also in cleaning up and having job done in promised time. Would recommend and use again for sure." 5★★★★★ - "I would highly recommend Pete." 5★★★★★ - "I stumbled into this website googling wallpaper removal. Glad I did. Pete is a great guy to work with! Very professional and reassuring. He has a great work crew very friendly and polite. Adam is an EXCELLENT worker! He is definitely a keeper. I would highly recommend him. Thanks Pete!" 5★★★★★ - "I contracted with Mulholland Painting for painting work at my mother's house in Havertown, in April 2011. I was very satisfied with the entire process. Pete responded promptly to my request for a proposal. He gave a careful appraisal of the work I requested, and was open to discussion on how the work might be done. He gave a comprehensive proposal, covering everything we'd discussed. He and his team did work both on the interior and exterior of the house. On the exterior, they scraped, primed, and painted all the wood trim around doors and windows. On the interior, they primed and painted two rooms. All of the work was of high quality and performed on time. Pete's crew was responsible and friendly, and took personal concern in doing a good job and leaving a clean job site behind. I would happily contract with Mulholland Painting again."